Stir Crazy is a Quickstart Adventure for the Full Moon roleplaying game. The RPG of life on the lunar frontier, Full Moon uses a slimmed-down version of the Fate system. This Quickstart includes everything you need to play a night of Full Moon: the basics of the rules, including Skills, Aspects, Fate Points, and Conflicts; an adventure good for a few hours of play; NPCs; map; and pregenerated characters with room for player customization. In the future, man has built settlements on the moon for the purpose of supporting numerous mining operations. These bases were built by corporations, but they are now manned by independent prospectors, men and women who endure loneliness and boredom in their isolated claims. 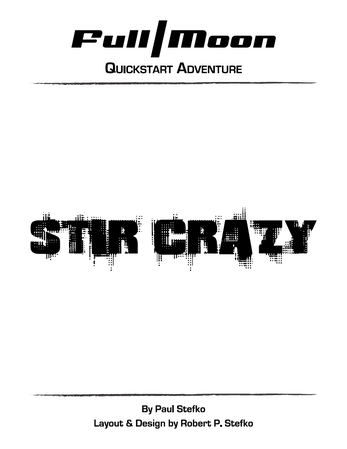 Stir Crazy is a story of one such facility. The player characters are hired to investigate a mining base that has gone silent, and they discover the tragic consequences of one prospector’s madness.